The Whirlwind Steel blog the judges liked will soon be revised for a new format that the company believes will be a major improvement. 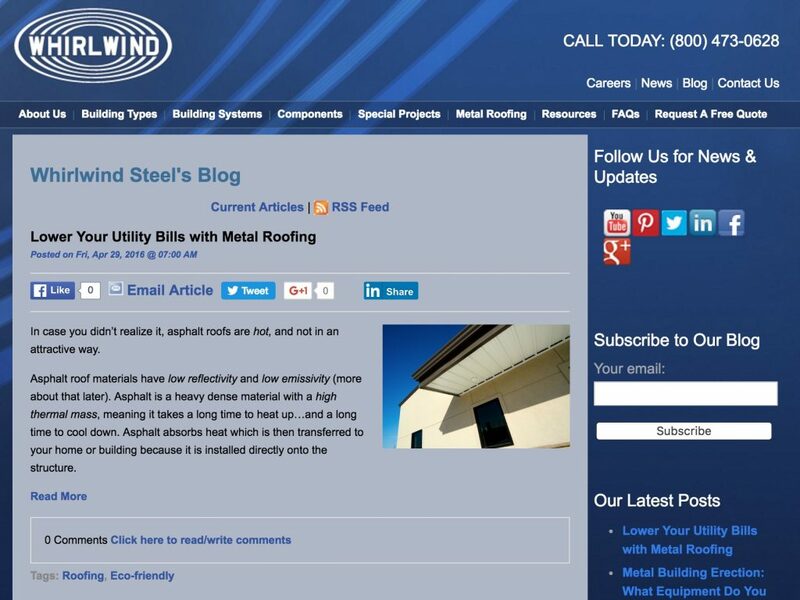 Whirlwind Steel has won both the judging and popular vote and is the top 2016 Best Construction Blog finalist. Yet, ironically, the blog that the judges reviewed and voters supported will soon be replaced by a revamped blog/website that “will be more modern, eye-catching, and easy to read,” says Whirlwind’s digital marketing strategist Aylin Poulton. “It’s been a long process, but the new website is just about ready to launch. Within a few weeks from today, we hope to have it up and running,” Poulton wrote in an email to us just hours before we received the final judge’s report and could tabulate the winner. Other judges included residential contractor consultant Michael Stone, blogger and proposals expert Matt Handal and Casandra Pollack, who also provides advice and proposal/marketing support for industrial, commercial and institutional projects. Judges were invited to assess graphic quality and appearance, content, and reader interaction and involvement. You can review the popular results here. We’ll of course report on the revised Whirlwind blog when it is released, and I will schedule a video interview with the finalist to gather some insights on how this company manages its digital/marketing strategies, and assess the results it has achieved.